Interlube Sytems limited manufacture the Filtakleen range of by-pass filters that will filter oils to 1 mircon. 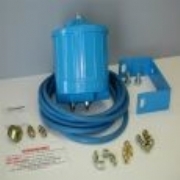 The filters can be used to filter engine oils and hydraulic oils. The filters will absorb water so the filter will increase the life of oil considerably. Please send me more information on BY PASS FILTRATION SYSTEMS.